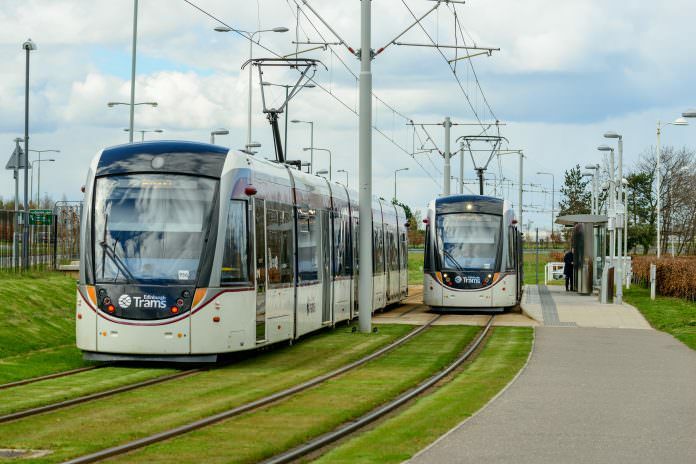 Home Light Rail New mega-buses to replace trams? New mega-buses to replace trams? Could advances in bus design threaten the role of trams on busy routes? New, longer designs which carry more passengers and combine flexibility with vast capacity. The Campaign for Better Transport’s website, on its page ‘Better…Trams’, states: “In large towns or cities, trams are often a good solution – they fill the gap between trains and buses. They can carry large numbers of people and can be integrated with existing public transport. So being able to carry a larger numbers is obviously part of the attraction of trams, as opposed to buses, which carry fewer passengers. But what if buses could carry as many passengers as a tram? Or even more? Would their flexibility in using a city’s road system outweigh the environmental advantages of a tram which is constrained by its tracks? 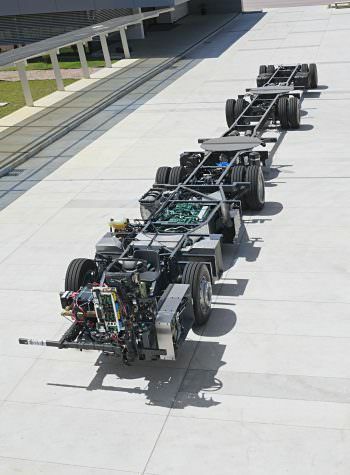 One of the word’s leading bus manufacturers, Volvo Buses, has now launched a four-axle bus chassis which is 30 metres long and can potentially carry 300 people. That’s 92 more than a Croydon tram, and 50 more than an Edinburgh tram. A biarticulated chassis (a bendy-bus with two bends), the new Volvo Gran Artic 300 was shown for the first time at the FetransRio exhibition in Rio de Janeiro, Brazil. Fabiano Todeschini, head of Volvo Bus Latin America, commented: “We are leaders in vehicles for high-capacity transportation systems, Bus Rapid Transit (BRT), and now we introduce the world’s largest bus chassis. Volvo has already delivered more than 4,000 buses to BRT systems in Curitiba, Bogotá, Guatemala City, Mexico City, Santiago de Chile and San Salvador. “We are proud to say that the world’s largest bus is a Volvo and that it was developed in Brazil,” said Idam Stival, sales engineering coordinator, Volvo Bus Latin America. Two: It won’t be as smooth as a tram. Three: It will be less energy efficient than a tram. Four: It probably will be noiser than a tram. But apart from that should fine. The electric (trolleybus) version is much better (and low floor). To power it requires overhead wires – for most of the way at least – and with that you have a major part of the infrastructure of a tram. Trolleybuses and trams can be complementary – as at Zurich. Are there side view and rear view cameras for the driver to see around the bends? Reversing must be quite interesting! I’d really want it to be semi autonomous, those trailers really need intelligent steering. If all axis are autonomously steered, then we may as well have ten carriage long articulated buses to replace trams about town. It would appear from the comments above and perhaps even Volvo have missed out on perhaps the most salient point which has already been established by the demise of the Bendy Buses of London which were of the typical single articulation…once the number of extensions is increased the problem especially with so many of our inner city streests is that unless they have segregated lanes and of sufficient width/turning facility they will be totally impractical. If they, as in some cities elsewhere designated lanes devoid of other traffic then perhaps this may be a solution with lower capital costs of the buses. Howver after the UK removed all of its trams other than in Blackpool, retained as a tourist attraction half a century ago for the similar reason as propounded now that they were too expensive noisy etc. well we all now know what a proverbial c*ckup that decision was. And don’t forget the “Bendy” bus concept has been largely abandoned in the UK.